Has fate ever brought a life-changing person into your life? A person you never expected, who over the course of several decades filled the roles of employer and mentor and friend? Fate did that for me. Her name was Carolyn Nichols. In the early ‘80s, diploma from my expensive Minnesota college in hand, I headed for New York City in search of fame and fortune. Well, no, not really. An entry-level job in publishing was all I wanted. At the time, I didn’t realize that the country was in the midst of a recession, and that I was one of so very many English-major graduates with publishing stars in our eyes. 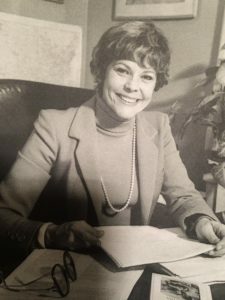 I spent four months sending out my résumé and going to interviews while working part-time for Denise Marcil, my mother’s literary agent (and later, mine). By late September, the light-green cotton suit that I had made specifically for job interviews was showing wear, and was distinctly out of season. That was when I interviewed with Carolyn Nichols at Berkley-Jove Publishing. Actually, no, it wasn’t, but of course I said yes. All these years later, that’s all I remember of that interview, but I was fascinated by this confident, energetic, passionate woman with the ready smile and husky laugh. Carolyn had recently begun a new publishing venture at Berkley-Jove called Second Chance at Love—distinctly American romance novels with feisty, non-virginal heroines. I hadn’t read a category romance in my life and never wanted to—but I eagerly said yes when Carolyn offered me the job of editorial associate. So began my amazing relationship with a woman who taught me just about everything I ever needed to know about editing and publishing, who was a mentor to me in my personal life, and finally a close friend. That friendship lasted thirty-six years and one month, until her death in October 2017. Carolyn already had an incredible life before she turned her attention to books and publishing in the 1970s. These obituaries, in Romantic Times and the Washington Post, are brief encapsulations of a life that focused on social justice and the arts. She was dauntingly well-read and informed. Whenever she began a conversation with, “As you know …”, what I knew was that I was about to be told something I had, in fact, never known. Naturally, books were our major connection, when we worked together and then after our careers paths took us in different directions. We always talked about the books we were reading, good or bad, dissecting them in the ways editors can’t help doing, analyzing writing technique, and character and plot development, and that all important “willing suspension of disbelief.” (Being an editor can just about ruin reading for pleasure.) After Carolyn retired and I continued working as an independent editor, I would sometimes call her for help with a problem in a book. Her advice was always valuable and spot on. In the last year, I helped her with a new book by an author she had published a few years earlier, and it was a delight to toss ideas around with her again, teasing out different ways the book could be improved, as we had done with so many other books at Berkley-Jove and then at Bantam Books, where I also worked for her. I went to visit her in Oregon a year ago. We talked—books and politics and people we knew. We drank too much coffee. We looked at pictures from way back when. She would remember one thing, I would remember another. It was a wonderful, heart-filling time. In the few months since her passing, I still sometimes think “I’ve got to call Carolyn” when I read something that intrigues me or makes me laugh, or when I am chewing over a problem with a new project. I miss her laugh, miss hearing her say, “Hello, EB, it is I, Carolyn,” and “But, Elizabeth, don’t you think …?” and “As you know …” I will always be grateful that such an exemplary editor taught me how to edit, and such an amazing woman was my friend.